In its infancy, The Weather Channel was little more than a punchline for jokes about the paucity of decent cable TV channels. These days, though, it’s a powerful brand. 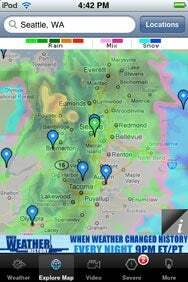 And its self-titled application for the iPhone and iPod touch is a welcome entré into a crowded field of weather-related App Store offerings as The Weather Channel proves to be good at what it does. I Get The News I Need From The Weather Report: The Weather Channel’s Home screen, which provides current conditions as well as one-click options to view hourly, 35-hour, and 10-day forecasts. The app delivers on its most basic function, providing current conditions at locations that you find by entering a city name or zip code into a Locations field at the top of the screen. The Weather Channel app clearly conveys the temperature, conditions (sunny, cloudy, raining, and so on), wind speed, “feels like” air temperature, humidity, UV index, and visibility in an easy-to-read format. If your weather conditions are superb, or brutally bad, you can even e-mail a summary to a friend (or enemy) via a Share button. You can also share the 36-hour forecast, but this function, useful especially to send to travelers, isn’t available for the hourly or 10-day forecasts. In addition to current conditions, The Weather Channel offers three static forecasts, which you can choose from buttons placed above a banner ad for the TV version of The Weather Channel near the bottom of the screen: hourly, 36-hour, and 10 day. The hourly forecast provides information about general conditions, temperature, precipitation, and wind speed and direction for the upcoming 12 hours. The 36 hour forecast is thin—it offers information similar to the hourly, which is not a whole lot, and it does so in a small font size that I found unusually difficult to read at times. I believe the difficulty lay in the choice to use The Weather Channel’s “branding” colors—a white font on a light blue background is standard throughout the App. There’s no option to change this. The Weather Channel also enables you to view the weather in any area on a static weather map, upon which you can layer radar, clouds, temperature, “feels like” air temperature, 24-hour rainfall, 24-hour snowfall, or UV index information on an opaque overlay. (The opacity is adjustable.) You can also choose to display both radar and clouds simultaneously, but this the only option to display multiple layers. You can press small pushpin icons on the map to pop up current weather conditions in nearby cities, and manipulate the map—moving it in any direction and also zooming in and out—using the touch screen. The map refresh was adequate, but not as sprightly as it probably could be, when I used it on my iPod touch on a Wi-Fi network. I’ve Looked At Clouds From Both Sides Now: The Weather Channel’s map view enables you to overlay radar and cloud cover visualizations simultaneously. The Weather Channel also provides video forecasts, 1- to 2-minute clips apparently transported over from the cable side; here is where you can find moving radar, which is not available in the “map” portion of the App. According to the Help screen, you can play video for any of 100 cities, and the city videos are updated every 30 minutes. Regional forecasts may be updated as infrequently as twice a day, and cut a wide swath; I live in central North Carolina, and found out more about the weather in Cincinnati from my “local” video than I did about the weather in Raleigh or Charlotte, North Carolina’s two major cities. The video for major European cities, such as London and Paris, doesn’t provide true moving pictures; instead, the weather maps for those countries are projected onto the screen as a background voice narrates the basic forecast. I found the Weather Channel to be about as capable as my favorite free weather app, WeatherBug. 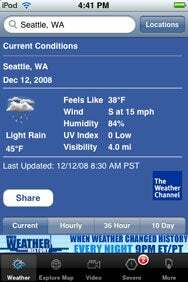 It lacks a few of WeatherBug’s nicer features, such as the ability to move among favorite locations with a simple swipe across the top of the screen—in The Weather Channel, you must type in a new location in the Location Bar or return to the favorites list—or the ability to view Webcam shots. WeatherBug provides slightly more detailed mid-range forecasts in a more readable (black type on a white background) fashion, and provides much the same functionality except for video (and the sometimes useful moving radar). Of course, I much prefer the mobile version of Weather Underground, which provides much more detailed and local information than The Weather Channel; I’ve bookmarked that page and turned it into a standalone pseudo-app. If you’re looking for more, you’ll probably want to check out some of the paid weather options at the App Store. But if you’re looking for a solid, but unspectacular, weather app that updates current conditions and forecasts frequently, The Weather Channel will serve you just fine. The Weather Channel is compatible with any iPhone or iPod touch running the iPhone 2.x software update.